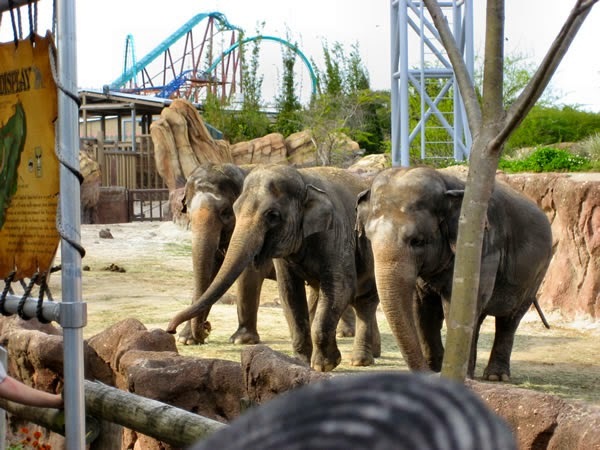 ThemeParkMama: BUSCH GARDENS CELEBRATES WORLD ELEPHANT DAY August 9th! BUSCH GARDENS CELEBRATES WORLD ELEPHANT DAY August 9th! TAMPA, Fla. (Aug. 6, 2014) – In recognition of World Elephant Day, guests are invited to join an elephant-sized celebration at Busch Gardens® Tampa on Aug. 9. Guests will get a firsthand look into Busch Gardens’ animal care with behind-the-scenes tours, trainer talks, interactive displays and an exclusive chance to dine with elephants. World Elephant Day celebrates the care and protection of the world’s largest land mammal. The SeaWorld and Busch Gardens Conservation Fund has granted more than $10 million to more than 700 projects around the world, including funding 10 elephant conservation projects in Asia and Africa in 2013 and 2014. The state-of-the-art Animal Care Center will be the hub for World Elephant Day activities with interactive displays and trainer talks from 9:30 a.m. to 5 p.m. The animal care team will share and demonstrate how they care for elephants, and guests will have an opportunity to help create enrichment activities! From 7 p.m. to 9 p.m., guests can join trainers for an exclusive behind-the-scenes experience, including an up-close look atBusch Gardens’ elephants and indulging in appetizers and specialty drinks while trainers share stories about elephant conservation and caring for these magnificent animals. The evening is limited to guests 13 years of age and older. Busch Gardens admission is required but not included. For more information and purchase tickets for “An Evening with the Elephants,” visit buschgardenstampa.com. Busch Gardens is owned by SeaWorld Parks & Entertainment™, one of the world’s foremost zoological organizations and a worldwide leader in animal welfare, training, husbandry and veterinary care. The company collectively cares for one of the largest animal collections on the North American continent and has helped lead advances in the care of species in zoological facilities and in the conservation of wild populations. For more information, contact Busch Gardens Public Relations at 813-987-5090 or BGTPublic.Relations@BuschGardens.com.